Corporates debate value of event apps: are they worth it? Speaking at C&IT's Corporate Forum on Friday (26 February), corporate event planners from B&Q and Hyundai discussed whether event apps are worth the investment. 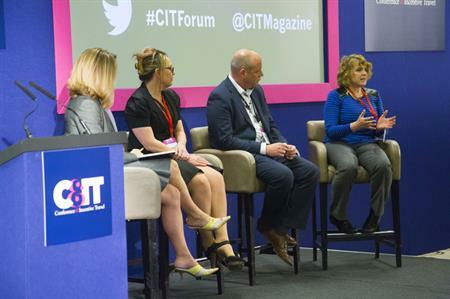 In a panel session Sarah Lawrence, business events expert at B&Q and Kate Conway, events manager at Hyundai Motor UK, argued the case for and against event apps. Meanwhile Tim Bull, managing director of sales at etouches, said the decision on whether to invest in an app will depend on a company's needs and should be carefully considered before execution. "I think it’s about finding something that fits with what you need. Read and listen and find out where to start; it’s certainly a journey." With 30,000 people at B&Q, a good engagement tool is key for Lawrence. After introducing specialist apps at events, she said she is able to convey messages not just to those attending, but to other people within the organisition who weren’t able to attend the event. "It meant they could engage, read the content, see the pictures and post things up, too." She added that while people were often put off engagement due to the embarrassment of standing up with a microphone, they could easily contribute questions through an app, and encourage debate. "At a recent event, delegates were blown away by the fact that the board were on the stage and they were answering all these questions." Lawrence points out that while some people were worried about learning a new or different system in a short space of time, there are ways to counteract this. "We had a helpdesk, so that anyone who was struggling with the app could get assistance, she explained. "I don’t think you don’t have to use tech if you don’t feel you need it," explained Kate Conway, events manager at Hyundai Motor UK. "I feel like we’ve got to the point where we want an app come hell or high water, and it’s not really the thing for us." She pointed out that many companies already have an internal communication system in place, such as Yammer, and don’t necessarily need another. "Do you want to force them down that route just for the duration of the conference? Or are you better to direct them to what they were using before?" Conway added that from her own experience, apps could be a waste of money if they aren’t appropriate for the event. "We had one for an event, at great expense. But there was only one big plenary and an exhibition in another room – the delegates just didn’t need an app to tell them this. I felt the money could have been better spent on entertainment, or another aspect of the event."